Please don't take offence, but that way looks really boring. It needs some life to entice your viewers (or listeners) to delve deeper. Use a calender with mouseovers. Here's an example of what I have in mind. This is just an idea... You have to do some lateral thinking here with me. Take this calender for example. few ;-) Circle some dates in red and have mouseover pop ups with a text description or picture/text tooltips. The calender will be one large image map with links on certain dates. Don't worry, it's easy stuff. I'll give you a hand with it. Just an idea. Use it or don't. No offence if you don't like it. I love new ideas!!! No offence at all but would this mean that I have to create a calender for every year from 1988 to the present? I know that what I currently have is kinda boring but I can't think of any other way. I thought of using tables as well but I think it would be a real pain to maintain. I'm looking for something esy and flexible. I'm sure I've seen a calender app in the MS Office suite somewhere. Can't remenber where now. You don't really need the pictures above each month. Maybe just one per year or none if you prefer. have to be once it's all set up? This is all done in Yola? I'm getting there. Sounds very interesting Boomer! Have you ever watched the show Mad Men? I feel like a client being sold on an ad campaign :). 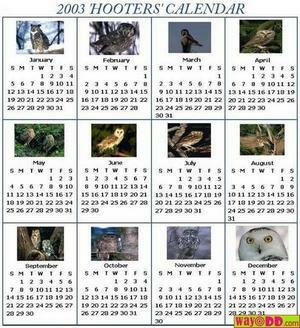 I'd love to try this calendar idea out and see what happens. Can you give me a hand with this? I could put pics of jazz musicians for every month. Of course I can give you a hand :-) I love trying new stuff. Thats how I learn as well. To start off, I'll set up a dummy page of what I have in mind and we can take it from there. If you dont like it you can back out at any stage. I really won't take offence. We all have different tastes and ideas of what we want. I'll put something together tomorrow - it's too late here to start now (also gives me some time to think about it). Mad Men - never seen the show, I don't watch much TV anymore. I like the idea of an artist per month. Is that how your shows work ? Do you highlight an artist per show or per month? I must confess, I've never listened to any. I like the calendar idea as long as it is easy for users to figure out. I was thinking of maybe putting a pull down menu of the years so that users can quickly go to a particular year. Just a thought. I'll wait to see what you come up with. Thanks for the help!! Are you in Europe? If this calendar option works out, I might use it for my playlists page as well. Here is another one of my sites. It's where I live. Close to Monique BTW. While you are on the page, have a look at the Horoscope drop down and how each star sign opens up in the same frame without leaving the page. Is this the kind of idea you have in mind? Each frame could easily be turned into a (calender) image map with the hover over tool tips you saw ealier on the other site. I really like that Horoscope effect! Simple, fast and visually appealing to the user. That's what I am after. So all of your sites are done with Yola? I used to use Rapidweaver for the Mac. It's a really nice app. Sort of a poor man's Dreamweaver. I find I am getting further quicker with Yola. So far I really love it!! Another issue I would love your opinion on has to do with my home page. I was wondering if there is a way when you click on a picture, text could be displayed below. Here is my old web site. You can see on the home page this effect. Thanks Boomer! I will wait to hear back from you to see what you come up with! Wow Randy, I didn't realise what a mammoth task this is going to be. The code part is the easy bit. The calendars and the gathering of all the images is going to be the time consuming part for you. Not trying to scare you off - I think it will look great if you go this route. I'll take my hat off to you if you do decide to do it. I'll be here all the way to help out, but my job is the easy part. There are only four maybe five shows a month. I already have some images if I decide to use them. I'm almost wondering if the same layout but with a table or somehow a modified calendar would be better because there are only four or five dats a month that would have shows. When I was using Rapidweaver, I went nuts trying different ways of presenting the data. I learned quite a bit from that. What I do like is the drop down menu wit the years that I would gather is very easy to modify? I love the pic of Neil, the man!!! What does the code look like that allows you to do all this? The code to do this is pretty simple once you analyse it. The way it works is by using iframes. Before I continue I'm going to apologise for my explanation of how the code works to all the coding guru's out there. This is just my way of explaining how it works and I'm sorry if I use the wrong terminology. What we have here is basically 4 pages. A "container" page and 3 other pages (2007, 2008 and 2009). Each page (year) is loaded into the frame when you select it from the drop down. You will have to create a new site in your account and have one page per calendar year. There may be an easier way (there always is) but this, for me, is the easiest way to edit them afterwards. Each year (page) is an image map with the coordinates mapped for your shows. Each coord (that you decide on) will pop up a tool tip and display an image or text that you have told it to display. Setting up the infrastructure to do this is quite simple. 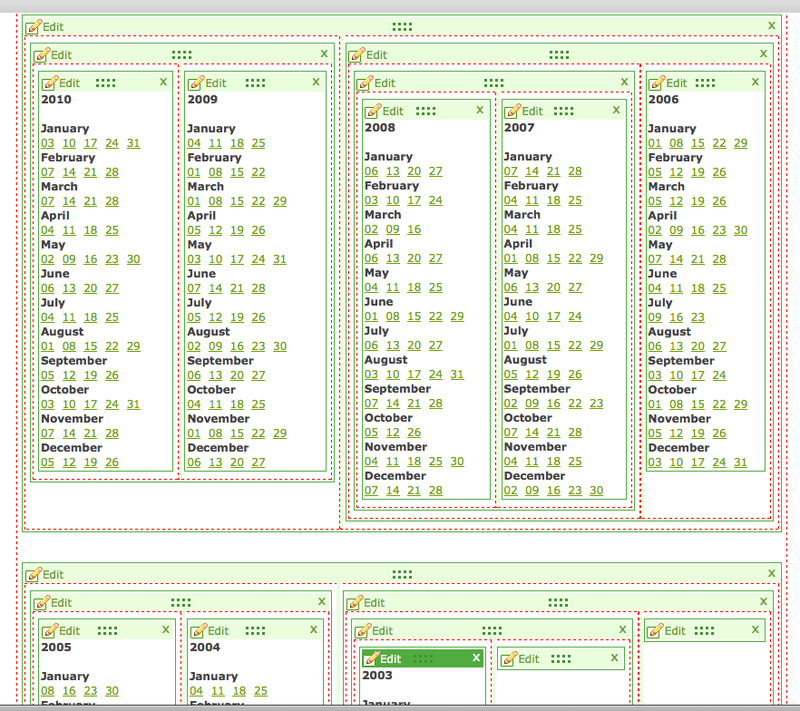 Creating the calendars and mapping them is the tedious part, but once done, I think the effect is worth it. Each calendar has to be exactly the same size. One pixel out and it will be noticeable. The easiest calendar to use, that I found in my brief search, was this one: http://www.vertex42.com/calendars/ I know the blue colour may not match your site, but it was the easiest one to demo what I wanted to do. Creating the calendar's is your job Randy, and if you want to make it simpler, by all means... I think it will be better as well. Just remember, they all need to be exactly the same size. The code to do all of this is split over the pages, so I can't just post it here in one shot. It's slightly more involved than that but like I said, not difficult. I will go through each step with you, one at a time. Terrified yet? Don't be. Give me the go ahead and I post the first step. Sounds good Boomer. Maybe you could make a screencast explaining all this, but as you said, I don't think it is all that diffficult. I just want something that is simple to setup/ maintain and that is scalable (if that is the correct word). I was just thinking that maybe I could just use what I have now (My Radio Shows page) and incorporate the drop down menu with the list of years so it looks more visually appealing Just a thought. Just saw this... It's up to you Randy. It can also be done this way - with a list. Let me know which way. Ok, now I'm off to bed. Cheers! Cool... let's start. The first thing we need is calendars... lots! Remember, all the same size ;-) You need to create a new site using the Clean Slate template (this is an important part). Call it Randy calendar or something (sounds like something Pirelli would call their site) Just kidding about the last part... call it anything you like. I think I'm about 9 hours ahead of you, so I'll check out how far you are tomorow. It's tomorow here already ;-) Good night! I think the list may be less work than the calendar? If so, how would I go about doing this? I will create a new site soon using the Clean Slate template as you suggest. We had a major snow storm today. Have t do some serious shoveling of the white stuff :) Do you ever get snow in South Africa? I just thought of something else. If we do go with the list idea instead of a calendar, maybe there is a way I can put my playlists, Radio Shows and both Archive pages all on one page, each with their own box and pull down menu. Sound feasible? It would surely simplify my site to only two or three pages. Wow guys.. I'm interested to see how this all pans out! We'll see where this latest adventure takes us. At least we will both learn something that hopefully we can share with the Yola community. I've done two more examples for you to check out. Hover over the link icons at the bottom of the two new frames. OMG Boomer, those two examples are awesome. I could use one of them for my interviews and the other for my Radio shows. Actually I think I can use this for all of my pages including my Playlists, Bennett Archives, and In Transition Archives, all on one page. Sorry, I have to pinch myself to see if this is really happening. You have made my day!! I see all kinds of possibilities now. Shat do you think? Is it easier using the list method instead of the calendar way? We can tweak a few things like maybe CSS to make it look even better but what you have done with these two examples is simple, intuitive to the user and functional. I really want to try this out. Thought you may like this :-) I also see loads of possibilities going this route. I need to pop out for 30min. Be back soon. This may be of interest to you Randy. Here is the test site as you requested. Is this OK? The image does not look white. Ok... go here and right click next to March (next to the blue header) http://hindsite.synthasite.com/frame-... Select "view background image". You won't see the image because it is white, but it is there in the top left corner. Right click in the top left corner and select "save image as". Save it to your desktop and upload it to your banner on the new site. I thought I had a white image but it looks light grey. Don't know why because when I recreated it it said white. OK. The header is now white.